Applying to TUM but unsure of which programmes you could apply for or whether you fulfil the minimum requirements for your course-of-choice? Our team is here to offer you Basic Counselling and Evaluation Services free-of-charge. Depending on the qualifications that you hold, we recommend the courses that you could apply to in TUM. 3. General information on studying and living in Germany (including accommodation, travelling, opening a bank account, scholarships available). Students who hold degrees from China, Vietnam and Mongolia are required to have an Akademische Prüfstelle (APS) certificate to apply to a German University. We know the challenges of you having to articulate your knowledge in a language that you are probably not comfortable with. Furthermore, the waiting time for a test date is long and the test costs you a rather big sum of money. Whether you are applying to TUM or to another German University, our interviewers fly specially to a city near you to assist you in preparing for the test. 1. Students will gain guidance in preparing for the test. 2. Students will undergo a short, mock interview with an interviewer from TUM Asia. The mock interview is done in a one-on-one format. Remarks and suggestions will be given after the interview. 3. Other students can observe the on-going interviews to learn from others. Do you know that you will need to submit at least 10 documents during your application to TUM and your application will be invalid even if one document is missing? If you did not submit the complete set of documents, this could potentially cause you to be assessed by the professors much later than the others, whose documents are complete. Moreover, different programmes may require different sets of documents. Under the Premium Application Support Service, our education specialist will assist you in checking through your documents, making sure that the documents to be submitted are correct and complete before couriering them to TUM at a small fee. Completeness and correctness of documents. a. Each application is capped at 500g. 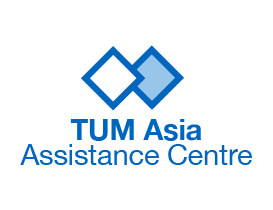 TUM Asia reserves the right to charge the applicant additional costs based on the additional courier charges, if each application exceeds 500g. b. The applicant must submit one full set of documents per application per programme.